Fouga CM.175 Zephyr The Fouga Magister was among the most wide-spread jet trainers of the World. However, its navalized version known as the Fouga Z"phyr was used only by the French A"ronavale. This version sported a strenghtened structure, naval equipment, different nose section and rear sliding canopies. Aboard French aircraft carriers and at the land bases it served successfully for long 35 years. 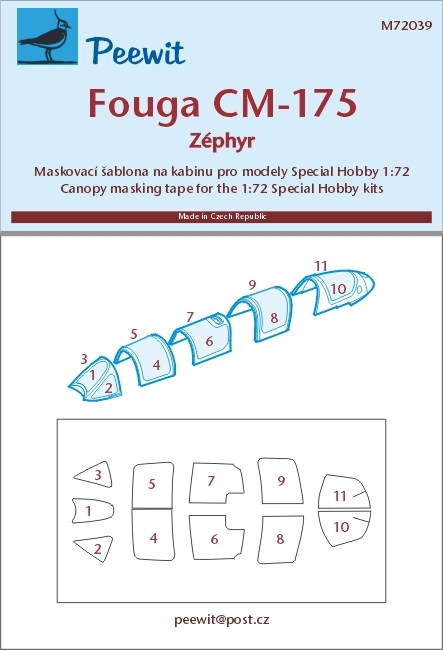 The kit which comes in a box with a brilliant box-art of a Zephyr during a landing and it contains in total four plastic sprues and one sprue of clear parts. 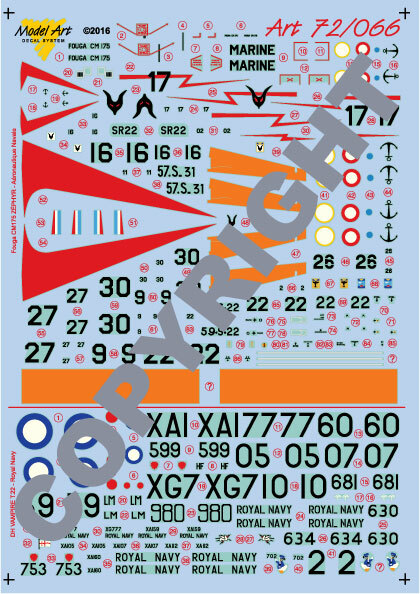 The decals offer an early machine and three with the later type of marking of the Aeronavale. Aero Navale Fouga CM.175 Zephyr and Royal Navy de Havilland Sea Vampire T.22s Royal Navy: De Havilland T.22 Vampire - 702NAS, 738NAS, 750NAS & 781NAS (Admiral's Barge FONAC). Aéronautique Navale: Fouga CM175 Zéphyr - Section Prototypes CEPA, Escadrilles de servitude 2S, 57S & 59S + Aerobatic Team schemes 1962 & Anniversary scheme 1993.